New York, NY (September 25, 2018) — Kaplan, a premier provider of educational resources and livestreaming learning services, and Hobsons, a leader in education technology and college, career and life readiness, today announced a partnership to provide free and low-cost interactive livestreaming and video on-demand programs covering areas including test preparation, social and emotional learning (SEL), middle to high school transition, and preparing for life after high school. As part of the agreement, Kaplan becomes Hobsons’ exclusive partner for livestreaming and video on-demand learning via Hobsons’ widely-used Naviance ecosystem, which helps navigate and guide millions of students to be more ready for college, career and life after high school in collaboration with their support network of parents, counselors, teachers and administrators. In the months ahead, Kaplan and Hobsons will offer Naviance users a series of free interactive livestreaming sessions aligned to the industry College, Career and Life Readiness (CCLR) Framework, which outlines the competencies today’s students need to succeed in life. The Kaplan hosted, expert-led, interactive seminars will cover an array of topics to help students with test preparation, adjust to the demands of high school, manage stress, and write compelling college admissions essays. These seminars will also help inform parents about digital literacy and navigating the financial aid process. Beginning in 2019, Naviance users will have access to an even wider assortment of Kaplan’s interactive livestreaming learning offerings. 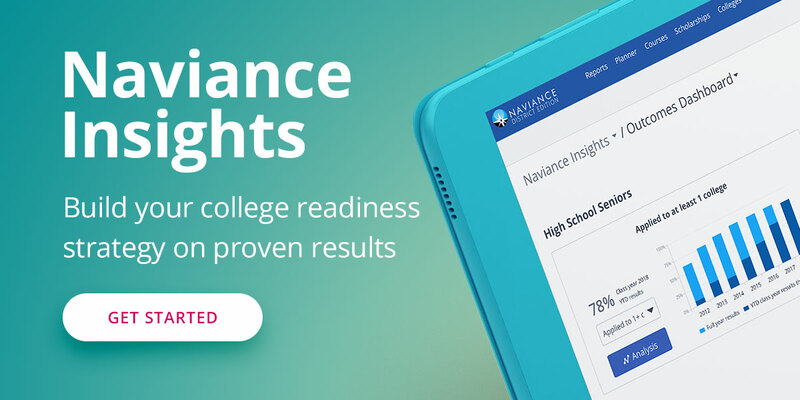 Visit https://www.naviance.com/kaplan to learn more. Test names are the property of the respective trademark holders, none of whom endorse this program. Kaplan Test Prep (www.kaptest.com) is a premier provider of educational and career services for individuals, schools and businesses. Established in 1938, Kaplan is the world leader in the test prep industry with best in class interactive livestreaming capabilities. With a comprehensive menu of online offerings as well as a complete array of print books and digital products, Kaplan offers preparation for more than 100 standardized tests, including entrance exams for secondary school, college and graduate school, as well as professional licensing exams for attorneys, physicians and nurses. Among those tests are the SAT®, PSAT®, ACT®, AP®, GRE®, GMAT®, LSAT®, MCAT®, NCLEX-RN® and bar exams. Kaplan also provides private tutoring and graduate admissions consulting services. A leader in education technology, Hobsons helps more than 15 million students to identify their strengths, explore careers, match to best-fit educational opportunities, create academic plans, and reach their education and life goals. More than 13,000 K-12 and higher education institutions partner with Hobsons and leverage our expertise and our solutions -- Naviance, Intersect, and Starfish -- to improve college and career readiness, college recruiting and admissions, and higher education student success to support millions of students around the world.